Good evening, dear readers! I have another CosmoprofNA post that wanted to share with you tonight. If you watch ABC's show, Shark Tank, you may already be familiar with Simple Sugars. 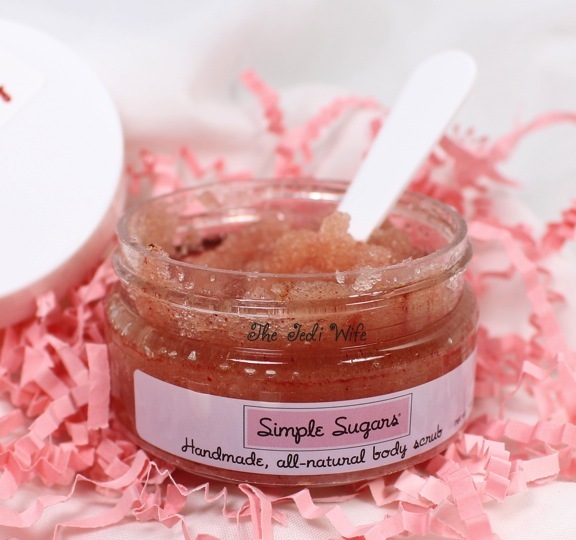 Founded in 2005 by Lani Lazzari, Simple Sugars was born by an 11 year old Lani when she was trying to come up with a gift idea for family and friends for the holidays. As an eczema sufferer, she wanted to create a product using all natural ingredients that would be safe for sensitive skin. Since then, the company has grown, but Lani's vision of all-natural skin care has remained the same. There are several sugar scrub options, each with a different formulation designed specifically for your face, your body, or your feet. 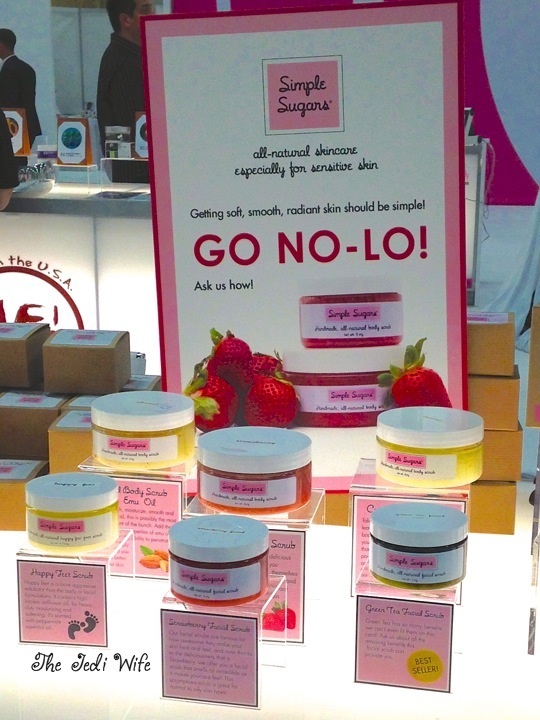 The slogan for Simple Sugars is "GO NO-LO! ", being able to go without needing lotion after using one of their products. They also have a line for men. 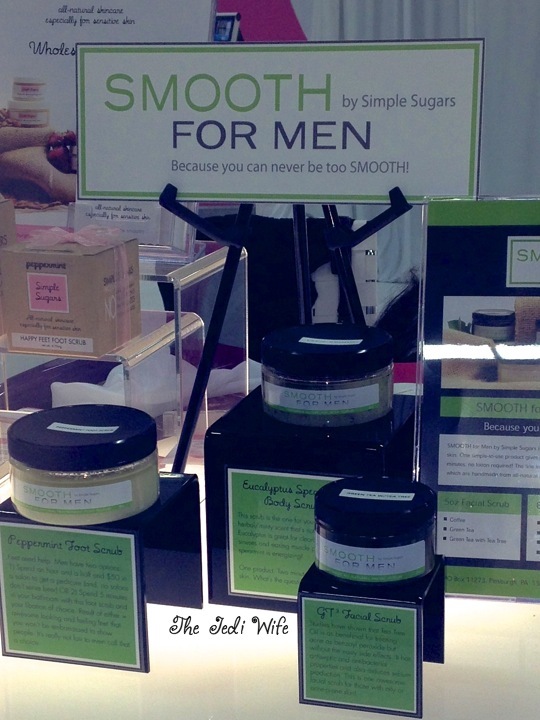 I actually tested out their Eucalyptus Spearmint Body Scrub on my hand while at the booth, and I really like it! The scent is nice for men but certainly not too "masculine"for women! I was sent home with a sample to try out their scrubs at home. It came with a little plastic spoon to scoop out the sugar mixture, something I appreciate since I have nails that extend beyond my nail beds! This is their Strawberry Body Scrub. The oils had separated some from the sugar, but a quick stir mixed everything up nicely. Dear readers, I really wish there was a scratch-and-sniff option for online blog posts! The Strawberry Body Scrub smells divine and reminded me of all things with strawberries that I love: strawberry cheesecake, strawberry shortcake, strawberry daiquiris... YUM! This scrub contains strawberry powder, and the smell is more like a real strawberry rather than the off-putting artificial scent. 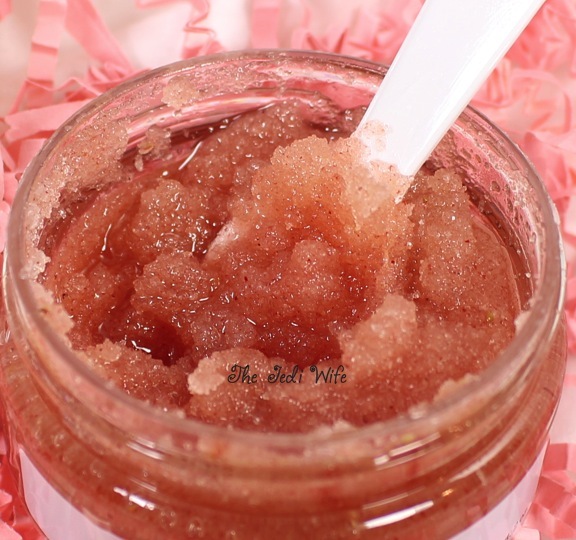 To get the full effect of this scrub, I scrubbed the product on my skin and rinsed it off to the point where I could no longer feel the grit of the sugar but I could still feel the moisturizing oils. My skin smelled deliciously like strawberries for at least a couple of hours afterwards. If strawberry isn't your ideal scent, Simple Sugars offer an assortment of scents to choose from. From fruity to floral and even coffee (complete with caffeine! ), there is an option for everyone! Have you tried Simple Sugars? What scent would you pick? Until next time, dear readers, have a wonderful night! XO! Her products do not have any preservative in them. Many of them have foods such as avocado and other food extracts which require a preservative. A drop of water into these products and they will immediately begin to form mold, yeast and microorganisms. And just because you can not see it, doesn't mean it isn't there. A customer on her FB page is complaining of her scrub having an odd smell. They have not addressed it. The scrub I bet, is adulterated.